With many years of expertise supplemented by continuous requalifications and training regiments, our professional technicians have widely become known as the best team in Libertyville. We have been providing both residential and commercial gate repair services for a while now, and we specialize on dealing with both sliding and swinging automatic system, as well as replacing the motors and backup power supplies of their opener units. We understand urgency can be crucial sometimes. That's why we make an effort to make it to you as quickly as possible, and to provide you with a solution to your problem that will be immediate and long-lasting. 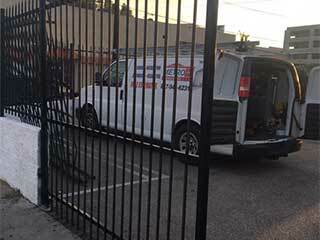 We don't want the security of your home or business to be compromised by a malfunctioning gate. One of the most common issues gates tend to suffer from is slamming into the end of their track when they're opening. This is usually due to either a motor gear problem or something to do with the circuit board. Sometimes, however, the issue can be resolved by adjusting the limit nuts. This will recalibrate the travel limit of your gate and will prevent it from damaging itself against its track. Regardless of what type of automatic gate system you are using, and who its manufacturer is, some amount of routine maintenance will be required. This is the best way to ensure that every part of your system is able to continue functioning optimally for as long as possible. It will also allow you to avoid wasting money on more expensive repairs in the future. We're sure many companies claim to be the best service provider in a certain area, but our team knows this for a fact. If you need a new gate and are looking for an affordable yet quality option, or if you need some part of your gate repaired or replaced, there's simply no one better to call than our experts at Garage Door Repair Libertyville. Our quick evaluation and actual repair skills have no parallel. Contact us for any related need.